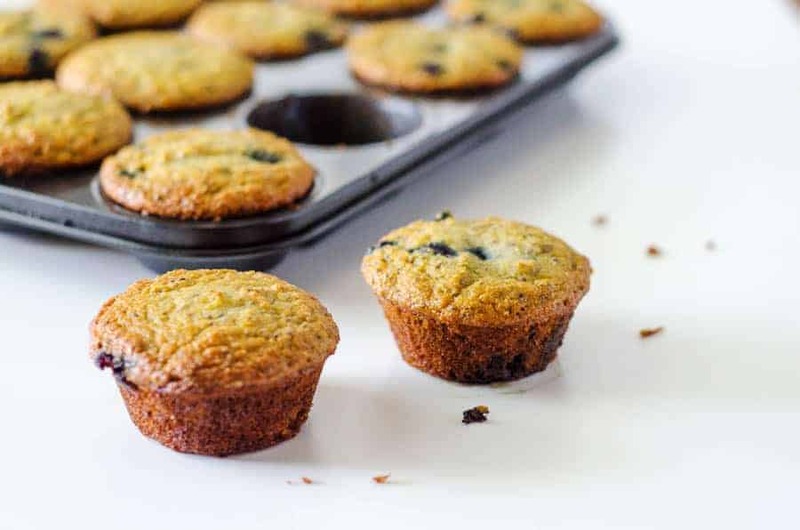 Bursting with blueberries, this delicious and nutritious recipe for coconut flour blueberry muffins is gluten free, nut free, and sure to please! Paleo baking is tough. I love experimenting with and creating recipes, but trying to make Paleo baked goods is a whole different frustrating ball game. I’ve got recipes I’ve been working on for baked goods that I just have to set aside and revisit later, because after too many failed attempts, you have to just step away for a minute and come back with fresh eyes and try to figure it out again. Why should you bake with coconut flour? Nut flour can be high in fat content. Healthy fats for sure, but way more than the handful of nuts you would normally eat. I just ordered some new coconut flour from Nutiva (which, btw, I have always pronounced new-tiv-e-ah, and it has been pointed out to me that it doesn’t actually have that extra “i” in it, so it’s likely pronounced new-tiv-ah, or nut-e-va? – anybody know?) and when it arrived, this recipe for these coconut flour blueberry muffins was on the back of the bag. Other benefits of coconut flour is that it is high in fiber and protein and free from wheat and other grains. Will these muffins get soggy? No! So fluffy. So crispy around the edges. Ok, not as fluffy as a gluten filled muffin might look, but still. They stayed just like this, long after they cooled! Usually when you bake Paleo, the bread or cookies or muffins come out of the oven looking super fluffy and perfect, then you take them out of the oven, and 5 minutes later they completely collapse. Then when you take them out of the pan, they either fall apart or are all wet and soggy. I’ve baked many other blogger’s recipes (some out there that I would consider the “pros”) and their bread recipes just come out with a soggy bottom, even though it looks perfect in their photos. It’s the pits! Are the chia seeds crunchy? Also no. They bake right into the muffins, and you can’t even tell they are there. All the health benefits, none of the seeds. 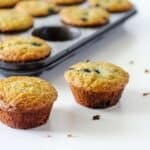 Just smooth, delicious, blueberry muffins! How long will these muffins keep for? 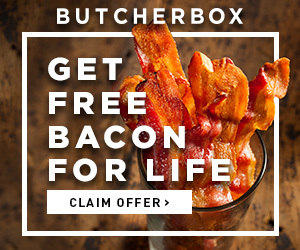 You can keep them in an airtight container on the counter for about 4-5 days, or in the fridge for about 7-10 days. These are great when you need to grab something quick in the morning and don’t have time for a full-on meal. You could also freeze them, and pull them out occasionally when needed. These coconut blueberry chia muffins are a grain-free alternative to the traditional favorite. Packed with healthy chia seeds for an extra boost! Grease a muffin tin with a bit of coconut oil. Combine the coconut flour, sea salt, and baking soda in a bowl and set aside. In the bowl of a stand mixer or using a blender, mix the honey, coconut milk, eggs, coconut oil, and vanilla extract until combined. Add chia seeds and blueberries and fold in gently. Fill muffin tins 3/4 of the way full with batter. Bake for 25 minutes or until muffins are golden brown and cooked through. Hi Denise! I didn’t feel like they had an egg taste, but I definitely think things like that are different for different taste buds – you might taste something much stronger than I would, and a third person might taste something different from either of us. I also eat the things I make that don’t turn out to be my favorite, because eating paleo is expensive – I am with you on that! Let me know if you try the muffins and if you find them to have an egg taste if you do! Hi Ashley! If you’ve never worked with chia seeds before, they are…well, weird! They absorb liquid, and turn it into sort of a “gel.” Obviously they’re not making a jelly consistency here, but they are definitely part of the structure in the wet/dry balance, so I don’t think you could leave them out of this one. Sorry! I just updated the recipe with a nutrition card, hope that helps!